The monastic life is about as far as one can get from the flashy world of the entertainment industry. And yet, it has been the subject of some very good documentaries over the last fifteen years or so. For those curious about the various monks (and nuns) of the world, I thought I would provide a list of a few films with which to start. This stirring art film by Philip Gröning was produced over several years. Every shot is deeply meditative. We, the viewers, are drawn into a contemplative pose along with the monks themselves. As might be expected, there is very little dialogue – indeed, very little sound at all. We get a powerful sense of the holy silence that envelops the Carthusians of La Grande Chartreuse. Yet when the monks do speak, such as in an interview with an ancient, blind monk that comes towards the end of the film, the words mean something. The chant of the night office given prominent place in the film evokes all the centuries of virtually unchanged monastic life that have come down to us from St. Bruno. This film is hands down the most important and most spiritually insightful documentary about monasticism, and it has continued to exert a powerful influence on most such documentaries since. The monastery of Sainte Marie-Madeleine du Barroux, founded in the wake of the Second Vatican Council, preserves much of the great tradition of French Benedictine life. It is one of the very few monasteries on earth which has preserved the form of tonsure once known as “the monastic crown.” It is also famous for its grand and elegant celebration of the liturgy, as well as the great holiness of its founder, Dom Gérard Calvet. This French documentary does a good job depicting their life through a mix of commentary and interviews. It is of an entirely different style than Into Great Silence, but it relates more actual information about the monks themselves. Filmmaker Peter Hayden of Wilderland Media has done some great and poetic work publicizing the various new monasteries founded in the old world by Americans. The first of these was the Monastero di San Benedetto in Norcia, established in 2000. It is only appropriate then that Hayden should have looked at them first. He produced a “day in the life” style documentary bearing clear influences from Into Great Silence. The slow pace, lack of commentary, and meditative minimalism all recall the best parts of that earlier work. Norcia itself – or what it was before the terrible earthquake of 2016 destroyed much of the town – emerges as a living community “seeking God.” A subdued sense of joy shines throughout. Br. John Baptist in adoration before the Blessed Sacrament, Silverstream. Photo taken by the author. Peter Hayden’s second work on the monastic renewal is a more obviously promotional piece of filmmaking than Quaerere Deum. A profile of Silverstream Priory, Benedictine Monks, Ireland depicts the community life of adoration and reparation led by the monks there. Scenes from Mass, chapter, and refectory alternate with candid shots of the monks at work and leisure. Interviews with the Prior and Subprior provide spiritual as well as historical context. As someone who knows the monks personally, I found it a pretty good exposition of their spirit. That peculiarly Benedictine sense of place is evoked through gentle Irish music at various points. And the combined wisdom of Dom Mark and Dom Benedict is a great grounding to the beautiful visuals. I was very taken with the image of Dom Cassian, then only a postulant, in prayer at the pillar and candle. My only criticism is that, in spite of all these good features, the film fails to capture the overwhelming sense of the supernatural that hangs about Silverstream. I’m not sure if it was the darkness of the year during filming, or the slightly uneven cinematography, or the lack of scenic order that scuttled it for me. Benedictine Monks, Ireland needs a heavier dose of the contemplative stillness that so strongly marks both Into Great Silence and Quaerere Deum. Still, it’s a nice introduction to the place for those curious about the Benedictine Monks of Perpetual Adoration. This short film, first brought to my attention by Fr. Joseph Koczera SJ, does a good job showing what a traditional monastery can look like, even if it embraces the new Mass and the vernacular office. Notre Dame de Sept-Fons is currently the largest Trappist monastery in the world, at least in terms of membership – it is also manifestly young and diverse. The film shows why the Abbey keeps getting vocations. A near constant soundtrack of chant carries the viewer along. Présence à Dieu is also full of the Abbot’s exposition of the Rule, which is a nice plus. This one differs from the others in a few key respects. First, it’s an HBO production, rather than an Indie film. Secondly, it’s about nuns rather than monks. And third, there is a delicate sense of humor throughout that is a refreshing change from the other movies. It tells the story of Mother Dolores Hart, a starlet of the 1950’s who appeared in several features alongside Elvis before becoming a nun at the Benedictine monastery of Regina Laudis in Connecticut. She is now the prioress of the community. The documentary looks at her life and vocation as well as the daily ins and outs of the monastery. Not to be missed! Monasticism is not confined to the Benedictine family. 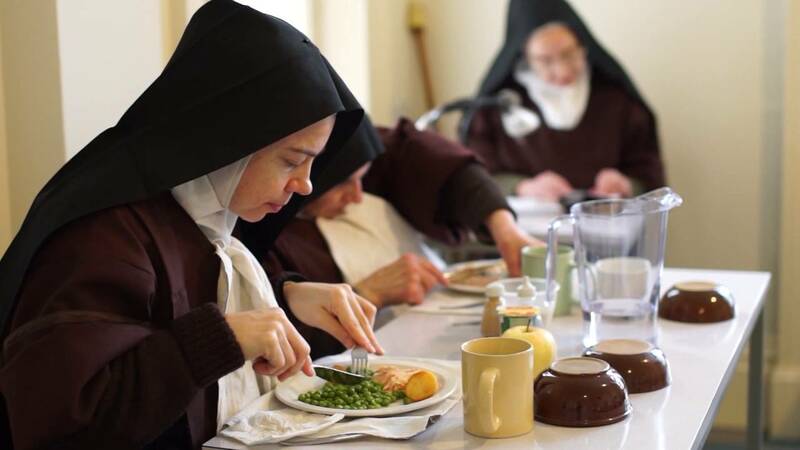 As Life in Hidden Light reminds us, the Carmelites also have a great tradition of contemplative monasticism. Clearly influenced by Into Great Silence, this film does a great job balancing meditative cinematography and interviews with the Discalced Carmelite sisters of Wolverhampton. One in particular that stands out is the old, mostly deaf nun who speaks about the “mess” of the world and the love of God. I was reminded of Into Great Silence‘s blind Carthusian (not to mention the slightly grotesque Jesuit in “The Enduring Chill,” by Flannery O’Connor). The old nun’s message is a sound, salutary one that we should all hearken to in this day and age. There are probably other such films out there, but these are a few that might be a good starting place for those interested in the monastic life. Isn’t that a drama, and not a documentary? Thank you for this list! There are many fine documentaries about Eastern monastics as well – The Brethren is one of my favorites. Things are going on well in Sept-Fons (they even have a plantation/daughter-house in Bohemia, methinks) mostly thanks to the exertions of Father Jerome Kiefer who occupied several positions in the monastery for a good part of the 20th century. As Novice Master, he was able to transmit the sound spirit of the strict observance and of monasticism in general, and to rein in the excesses of the that century. His notes and correspondence have been gathered in books, which I heartily recommend to the readers of this blog.